Now Shipping to all 48 States and Canada! TWP 200 Series is a 94%+ solids, penetrating finish designed to extend the life of exterior wood such as decking, cedar shake siding, and shingles. Containing a paraffin oil, TWP 200 series penetrates wood extremely well. The Paraffin oil is a "non-drying" oil that enhances the wood cells structural stability. This greatly improves the woods life and appearance. 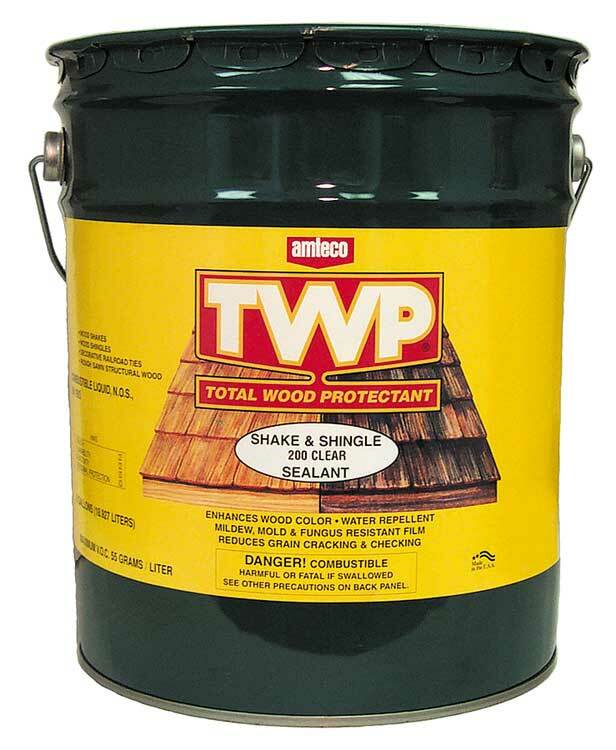 TWP is a registered trademark of AMTECO, Inc.
Great stain for shakes and shingles. Can be used for decking as well. I just got a deck built and wanna keep the original look. How long do I wait to stain it and what's the best color. It is treated wood. Any color you like will work. I have a PT deck that is approximately 10-12 yrs old. I live in Ontario with harsh winters, and hot summers. It's in good structural condition so I would like to refinish it with an oil based stain that will provide max protection against UV, and mold, what stain color would you recommend? Hello, any color that you like will work very well for you in the TWP 200 Series. Darker colors will allow better UV protection. Butternut, Russet, Redwood, etc. How many coats for for a 15 month old cedar fence? I have a new deck with western red cedar. Want a semi transparent to highlight the grain and natural color, nothing golden or orange. I was thinking 205? All new wood will need to weather for 4-12 months and properly prepped (cleaner and a wood brightener) before applying the TWP. Once this is done, you can use any color of the 200 series. Just one coat. Use the TWP 202 Redwood color. Hi, I am looking for a medium brown tone for my (green) pressure-treated pine wood deck. The deck sat for about 10 month in Alberta weather (long snowy winter and hot spring sun). What stain color do you recommend? Hi Steve, look at the Butternut 207 color. Make sure to prep your new wood before applying. The TWP 1500 Series has a natural colour finish. What is the closest colour to natural in the TWP 200 Series. Cedar Gold is the lightest tint in the 200 Series that has UV protection. Will the Cedar Gold have a orange look to it or will it have a more light brown look. Thanks. Depends on your wood type and age but leans towards golden tint. WE stained our 1200 sq ft deck last year with TWP 200.The cedar planks were perfect, the conditions under which we stained it too were perfect and were happy with the coverage and the colour. I am noticing, however that it has faded considerably especially around the area of the knots. 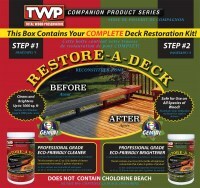 I was considering rubbing an additional coat on the entire deck to darken these areas and further protect the deck. Do you recommend that I do this? I am surprised that the stain has only stood up this one winter season, 8 months only. There is no pealing or anything like that, just fading. Knots are always lighter in color due to the density of the wood there. Nothing you can do to stop this nor will it cause any harm to your wood. Just leave alone. 1. What coverage (sf/gal) should I expect? 2. Life expectancy? Procedure for re-coating? 3. Do you ship small samples (e.g. for color-testing on the target wood)? Is there a Canadian distributor in my area? I've got a new board fence, 6' x 250', MicroPro Sienna treated brown. I'm located near Hamilton Ontario Canada N3W0A6. 2. 2-3 years on a deck surface. 4-6 years for a fence. 3. We do not have samples. No dealers in Canada but we ship there. Hi, does the TWP 200 come one gallon containers? We only sell it in 5 gallon pails. Hi, do you ship TWP 200 stain to Canada? If so what is the shipping cost?